Been using this blade for 12 months. Its a little heavy, 88g, but the control and speed offering due to a little extra weight is brillant. Great for a close - mid table game, with evolution mx-s rubbers. Has a little flex, and very large sweat spot like a carbon blade. 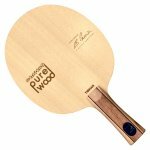 Soft feel, plays well with harder sponges, like chinese, vega pro, jp01 etc, The blade is perfectly balanced, so it feels lighter than it is. Perfect blade for most players. Needs a seal though, this blade should last the distance, 10 plus years.